I know Sukiyaki, the song- a beautiful, sentimental song translated from a popular Japanese song but I had no idea what a sukiyaki dish was, I did have a vague childhood recollection of it as sauteed meat and veggies but I can’t quite remember the taste. I recently had sukiyaki from a Japanese resto and it has a distinct taste of Japanese soy sauce and mirin; it didn’t have any veggies at all, just beef in broth ..hmmm, now I wonder if they have forgotten to put the rest of the ingredients before serving it to us. It is quite a flexible dish, you can add or omit some ingredients as you please as long as you have the base which is the sukiyaki sauce/broth and the meat, of course. 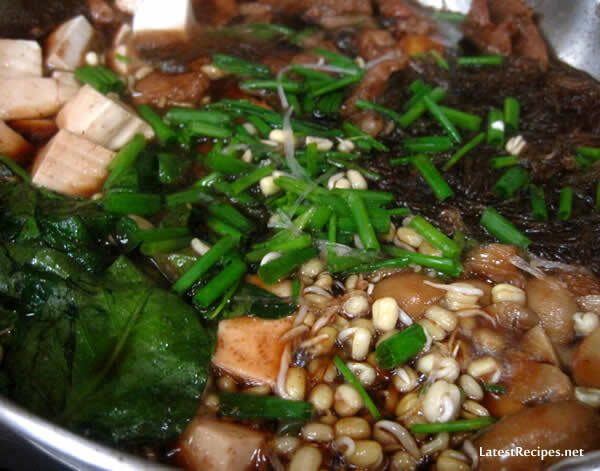 For substance, mushrooms, tofu, cabbage, leeks or spring onions, glass noodles-the basic ingredients for sukiyaki- are added. I think the important thing to keep in mind here when making substitutions, make sure that it cooks quickly, that’s why you need to cut or slice ingredients into small or thin pieces. (ahaha, I sound like I know a lot about this dish -thanks to google and wikipedia, actually I’m just making a valid excuse for my lack of ingredients.. 😉 lol it’s my first time to cook this dish). Savory with a touch of sweetness from the mirin, this soup is a complete meal in itself..it's perfect for cold days or nights. Arrange ingredients on a large plate and place the plate on the table. Mix soy sauce, sake, sugar, and water to make sukiyaki sauce. Set an electric pan or a skillet on the table. *After this point, cooking is done at the table as you eat. Heat a little oil in the pan. Fry some beef slices, then pour sukiyaki sauce in the pan. Add other ingredients when the sauce starts to boil. Simmer until all ingredients are softened. It's ready to eat. Dip the cooked sukiyaki into the raw, beaten eggs if you would like. As the liquid is reduced, add more sukiyaki sauce or hot water. 2 Responses to "Sukiyaki (すき焼き)"
Mmm… I want a big bowl of this sukiyaki now. So Yummy!! That beef is making me drool!!!! !